98-rated Hazard! 97 Ibra! 95 De Gea! It’s Team Of The Season time in FIFA 17 Ultimate Team, and the one thing more certain than Cristiano Ronaldo receiving a 99-strong ‘TOTS’ card is that you won’t be able to afford it. Or, indeed, any of those aforementioned names. Hope isn’t lost, however. Rather than saving up the millions required for super Ronny when the La Liga team hits, you can go bargain bin shopping and build a forceful squad around any number of surprise superstars. Names like Shelvey and Vaughan wouldn’t have registered even two months back, yet they can now be used to form the spine of a talented English team. So if you have money to spend and an open mind, take a punt on any (or all) of this TOTS super seven. All prices accurate on PS4 as of 2pm on Tuesday 30 May. The former Spurs man has an 88 overall rating, and will instantly upgrade any Calcio A side – yet is available for an insanely cheap 22,500 coins. That’s because sweaty players overrate speed, and his Pace rating is a snail-like 40. Don’t be put off by that: at 6’4’’, with ratings of 90 for Defending and 88 Physicality, he’s as rock solid as a Dwayne Johnson statue atop Blackpool Tower. If you’re playing with an all-French team this nippy wideman needs to be installed on the right flank sans délai. His 90 Pace and 85 Passing ratings can be used to supply crosses to myriad monster gallic forwards: Giroud, Gignac, Griezmann, even some whose names don’t begin with ‘G’. With the RSL an unfashionable league to build sides around, Ravet’s 87 overall will set you back just 22,500 coins. Magnifique. Turning your nose up at an overall rating of 83? Point those nostrils floorwards, friend. Look beyond the OVR and, for 22,000 coins, you find one of FIFA’s most well-rounded English strikers: 87 Pace, 86 Physicality, 88 Shooting. Use a Hunter or Hawk chemistry card on him and you’ve an instant rival for, or complement to, the identically initialed Jamie Vardy. Strike partnership nickname: Va va voom. Standard Liege’s star striker, capped 14 times by Algeria, is an impossible one to mesh into your all-Prem, or all-Ligue 1, or all-Icelandic super teams. But even if you don’t use him, he’s an incredible investment to hang onto, with Squad Building Challenges requiring TOTS players almost certain to drop at some point during the summer. At a measly 21,000 coins get him bought and benched, in readiness for big profit. 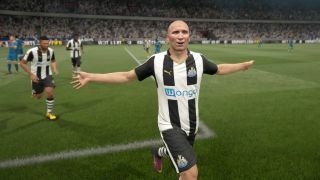 Back in the Premier League next season after a one-year absence, Newcastle United’s centre-circle quarterback is rewarded for a superb campaign with this 85-rated card. You’re getting ratings of 88 Passing, 82 Dribbling, and 86 Physicality and – importantly for Starhead obsessives – one of the game’s most distinct likenesses. At 23,000 coins it’s time to let Jonjo loose in your all-England midfield. Bundesliga TOTS cards are currently far more costly than experts foretold, likely because most FIFA diehards spent all their coins on the Premier League packs which preceded the German league’s release. As a result bargains are in short supply, but Grifo is worth a look. As a winger, his lowly Pace rating of 80 is putting people off; but with 86 Passing and 88 Dribbling, he can still be incorporated into a patient player’s all-Bundesliga XI. Already looking ahead to next year? Be sure to check out the 11 key changes FIFA 18 needs to make - according to fans.